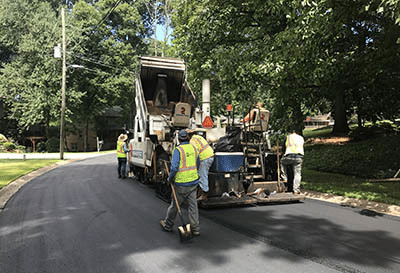 Construction crews are scheduled to begin paving operations on Womack Road from Tilly Mill Road to Chamblee Dunwoody Road beginning Sunday evening, Sept. 16. The paving work will occur overnight between the hours of 8 p.m. and 6:00 a.m. Sunday thru Thursday, weather permitting. The overnight paving work and continuous operations allow for expedited project delivery. The expected total duration of the paving project is anticipated to last seven to 10 nights, weather permitting. During this same timeframe, crews also will be patching a section of roadway on Vermack Road in the area between Parliament Drive and Parliament Way. Travel delays and lane closures can be expected during the work period and crews will be on hand to ensure safe passage through the construction area. The city is reminding motorists to plan ahead and select alternate travel routes to avoid these areas during the active overnight paving operations. Dunwoody spokesman Bob Mullen said the construction will result in lane closures, but the road will remain open. “There will be lane closures on Womack Road during the construction but the road will still be open so there is no detour. Mt. Vernon and Peeler are alternate East-west routes,” he said.